There were three Battle Packs made available in the Movie Heroes collection's initial release in January 2012 including the Geonosis Arena Battle, Rebel Heroes, and Republic Troopers. This assortment debuted the all new Battle Pack blister card design that replaced the shadowbox designs from all previous Battle Pack releases. 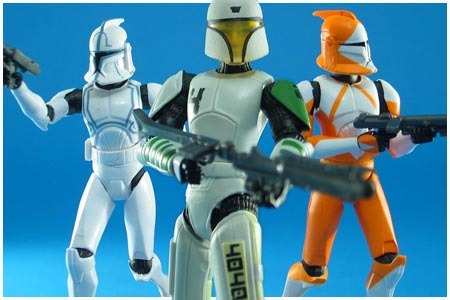 The Republic Troopers set offered Star Wars fans three new Clone Troopers using existing figures. The Cutup figure is a repaint of the 2010 Clone Wars Hevy figure, and both the Bomb Squad Trooper and the Hardcase figures use the 2010 Clone Wars Commander Stone figure as their base.